One vet is talking to the media about cannabis safety to ensure pet owners know the risks of cannabis and their pets. 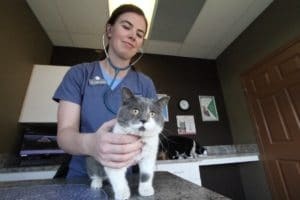 Dr. Katie Graves, of Lomsnes Veterinary Hospital in Red Deer, Alta., has treated at least one dog since cannabis legalization in Canada in October 2018. “It was in a cookie form, and it was the type of dog that likes to eat everything,” Dr. Graves said. She induced vomiting immediately because waiting too long can be dangerous. In those cases, Dr. Graves inserts a tube to place charcoal in the dog’s stomach, which prevents the more cannabis from being absorbed into the system. “Sometimes, they have to stay overnight on IV fluids, but overall, most of the owners we have had brought their pets in right away,” she said. Luckily in this case, the pet owners knew exactly when their dog ingested the cannabis and rushed to the vet. Dr. Graves hopes that cannabis legalization will lead to greater cannabis safety including seeking medical help right away if their pet ingests cannabis. Dr. Graves said that a few dogs have eaten from bags of cannabis, but most accidents occur when they eat cannabis edibles like cookies. There isn’t an established “safe” amount of cannabis for pets. The best cannabis safety policy is to avoid exposure altogether.